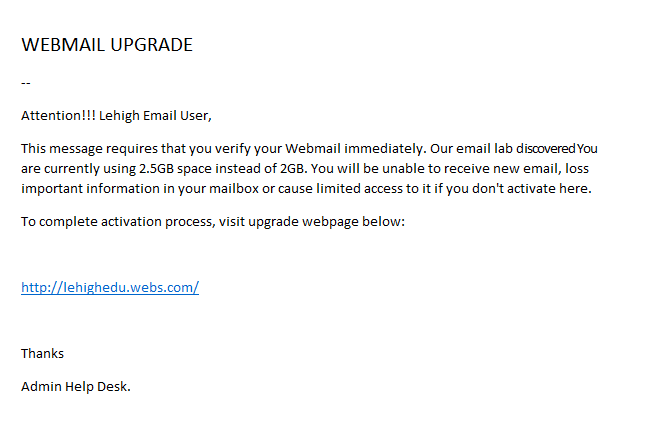 This message indicates that you are using more space for web mail than you have been allocated. It threatens that unless a link is clicked to upgrade the account, the account holder will be unable to receive email. Notice that the message is signed "Admin Help Desk" (no such thing), refers to "email labs" (again, no such thing), and that the link points to someplace that is not lehigh.edu. Clicking the link can result in having your account credentials compromised. This email should be regarded as SPAM and deleted.